Brand NEW, heat-treated forged Mustang II steel spindle that retains the exact OEM geometry of the 74-78 Mustang II or 74-80 Pinto spindle. IMCA approved. 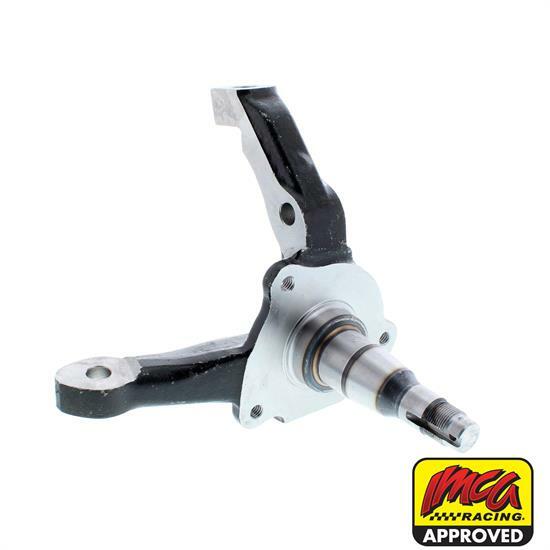 Works great with our 10" HD Hybrid Rotors as well as with stock rotors, bearings, calipers, ect. Stock 7 5/8" height. Easy to install. From lower ball joint hole to steering hole is 5"
For the ball joint holes: Inside measurement is 5-7/8" and outside is 7-5/8"
Learn more about the three piece spindle, which offers improved geometry, replaceable steering arms, and compatibility. Applicable to modifieds, sport mods, stock car and hobby stocks.